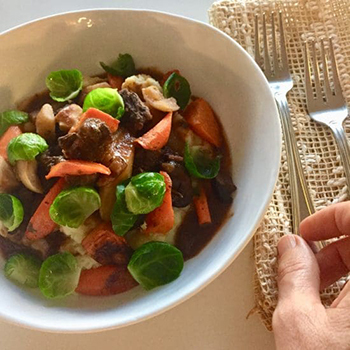 As culinary icon Julia Child says, “Beef bourguignonne is certainly one of the most delicious dishes concocted by man.” We whole-heartedly agree. So much so, that we have made this classic dish the centerpiece of the Barber/Whiteford New Year’s celebration each year. Boiled potatoes are the traditional accompaniment, but we love this dish atop our Creamy Dreamy mashed potatoes, (also on on website.) If you are going for low carb, cauliflower puree is great too. We add a touch of color, by garnishing with brussel sprout leaves or steamed French green beans. One of the best things about beef burgundy is that it’s better made a day or two in advance, and freezes well. Pair it with a cool bottle of Pinot Noir (the principal Burgundy grape) to ring in the new year with spirit. 1/2 lb cremini or shiitake mushrooms, cleaned and quartered. If using shiitakes, be sure to discard the stems. Put the bacon in a ovenproof, 6-quart, heavy-bottomed pot or Dutch oven. Cook over medium heat until lightly browned and slightly crisp, about 10 minutes. Remove the pot from the heat and transfer the bacon with a slotted spoon to a paper towel–lined plate, leaving the fat in the pan. Set the pan over high heat. Add the meat and cook until browned on all sides. Reduce the heat to medium-high and add the mushrooms, chopped onions, and pepper. Cook, stirring constantly with a wooden spoon, until the onions are tender, about 5 minutes. Sprinkle with the flour and cook for 2 to 3 minutes more. Add the wine, broth, tomato paste, rosemary, bay leaf, brown sugar, and the reserved bacon. Stir, scraping up any brown bits from the bottom of the pan, and bring to a slow boil. Cover the pot and transfer to the oven. Bake for 1 1/2 hours. Remove the pot from the oven and add the carrots and pearl onions. Bake, uncovered, until the carrots and meat are tender, about 30 minutes more. Garnish with chopped parsley and serve. Note: If you use GF flour for the meat instead of AP flour which we do, you may need to thicken your sauce at the end with a touch of cornstarch.